We have an air date for the new OUTLANDER TV series! SONY is the corporation that actually owns the film rights. STARZ is the American production company that is _making_ the tv show and who thus has the US licensing rights to air it. Sony will license the show to other countries individually. This is the announcement about the Starz showing, which is why it’s for the US. The UK, France, Germany, Sweden, etc. are NOT being discriminated against; they (and a few hundred other countries) just don’t YET have licensing deals. 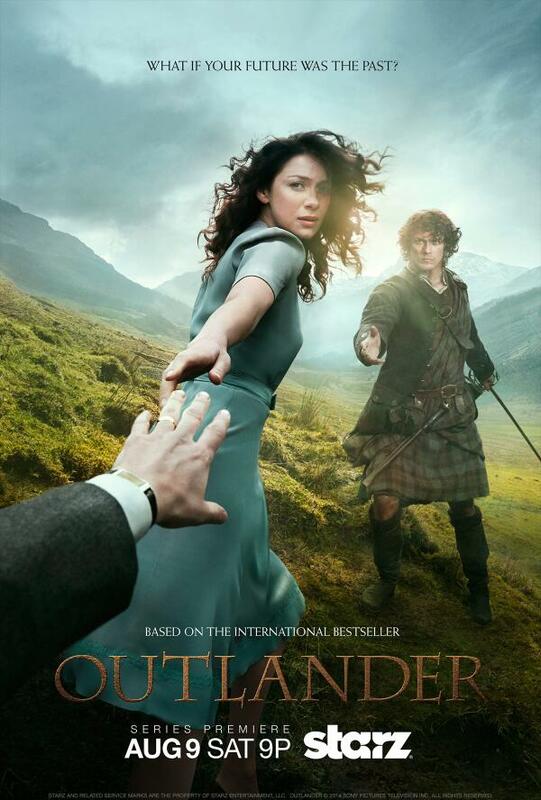 STARZ’ production of OUTLANDER will air in the US on August 9th, at 9 PM EST, as the poster above says. This is a regular cable-TV show (not a movie, not a mini-series), with a first season (and we hope there will be more) running 16 episodes. The first season covers OUTLANDER only; subsequent seasons, if we get them, will cover the other books. Hang onto your seats: it’ll be FUN! The show airs on August 9th (in the US), so I wouldn’t expect ratings before then. Thanks for your reply It is so awesome that you take time to answer your readers. The ‘real Diana Gabaldon’ answered my email (goosebumps, hehe). As a Canadian fan I am eagerly awaiting August 24th (Showcase) for the show. I’m re-reading Outlander (3rd time). Love your writing. Diana Gabaldon, I bought the whole series several years ago and loved them all so much when I purchased my kindle fire HD I bought the series all over again through amazon ebooks. I can’t wait for outlander to come out I’m really looking forward to it. I just know it will be awesome. I’ve posted it on Facebook. I just watched the first episode, all I will say for now ammmazing!! Ok just watched it myself!! I realize premier date was 8/9/14, however it showed up this weekend ‘on demand’ for Starz! Thought it might be fluke… it was not! Very good first episode; have already set series to record starting on 9th, first episode titled Sassenach. If you subscribe to Starz and have ‘On Demand’, you might want to check it out if you (like me) just couldn’t wait another week!! Well worth the wait, very impressed with episode & looking forward to rest of series!! I keep seeing previews on TV !!! don’t forget, Sunday night Aug 24th – Showcase ! First let me say I absolutely love the Outlander book series and like everyone else can’t wait for the next one and at the same time don’t want the series to end, frown. I have watched the free episode of the Outlander series and love it too!! What about those of us that don’t have STARZ??? I already pay my cable company over $100.00 monthly and they want another 20.oo per month to add STARZ. Even if I chose to get it (which I won’t/can’t), I would still rather have a dvd to hold on to and replay at will. I have reread your books at least 5 times and would definitely replay the tv series if I owned it. I sent Starz an email asking them if it will be sold, hopefully the reply will be yes. We just had a Scottish-themed dinner party and watched the Aussie premiere…loved it! I have been an avid fan for the last 20 years or so and have just finished Written in my own hearts blood…wonderful and well worth the wait. Thanks so much for all the information I just wish I was privy to it before this week, as I have stars and had no idea about the adaptation. I read the books a while ago when someone close to me told me I had to read them, she lived in Az. At the time. I read the first and was hooked. You my friend a a brilliant storyteller. I was in a local bookstore last week and saw the novel w/ the advertisement for the show and my heart jumped. I am always concerned that when books become movies they leave me wanting. However when they are turned into shows,especially on premium channels I.e. HBO, Stars etc. They usually cast well and are able to truly bring the story to life as they have a lot more time to do so. As in Game of Thrones. I have been watching the episode playing tonight and it seems to be done well. Unfortunately I desire to watch them in order, so I need to auto tune the first episode or wait for the DVD as I so often do. I have high hopes for this endeavor. I bought my uncle the first book a few years ago for Christmas, though he is more of a A. Rice, and K. Vonnegut fan he loved the book as well. Its a story that Transcends genres. Fantastic I am so happy that this tale went this route, thank you to everyone who made it possible. Congratulations and thank you. So far the TV adaptation of the book is SO well done. I am thrilled to be seeing the words I read come to life. The casting for Claire and Jaime are perfect. I, like most, were so worried about who would be cast and if they would be able to bring this couple to life and they have done such a phenomenal job. Thank you to them as well. Waiting for show on Saturday is almost unbearable and when the episodes end I am so disappointed. It has led me to read the series again. Just awesome. Being an Outlander lover, I was worried the show would not be done properly. I was wrong. This is absolutely the best series I’ve ever seen. The actors are all perfect for the book characters. Love all the interviews. Thank you Diana for your wonderful imagination! Finally my friends are buying the books and watching the show. They now understand how great the books are. I read the first Outlander book many years ago and for some strange reason could not get it out of my head. Then fate led me to the second book and the rest is history. Now I have all the books. And to see this story made into a series with such great actors playing the characters is fantastic. I have already purchased Season one and will purchase each season as they come out. Thank you Diana for having such an amazing imagination to create such a wonderful story. Just watched the last episode of season one tonight on Foxtel’s Soho channel in Australia. I am hooked! How can we possibly wait until April 2015 for the next episode? Is there any chance it will be released on dvd anywhere in the world before then? I am almost finished with Outlander (first book). I thank you for writing this group and look forward to finishing them. Excellent story, well constructed settings- made me feel as if I was there. Do you know when it will be available. On DVD? I could watch this over and over again. Keep up the good work. I also have the books and started reading them. I sure would love the DVD. Diana, I was turned on to your outlander series very recently. Have read all 8 books in 4 months. Prolific, emotional, funny and so many other words to use but in the interest of time I’ll just say that I laughed, cried have completely fallen in love with the characters. My husband who was killed in a tragic accident speaks the me through Jamie. As he was scotch/Irish as am I, the wedding vows of Jamie & Claire brought back lovely memories in that we also included”bone of my bone…”. Such hard times. Takes a very special person to survive with such odds. Looking forward to knowing how Bree/Roger, Ian et al & of course William all complete their final journeys. Thank you again for this wonderful journey you have given us. My wife is a huge fan of the books and has been waiting patiently for the show to air in the UK. I’ve just discovered it will only be shown on Amazon Prime instant video in the UK, which is hugely disappointing. I now have to consider whether to buy a new (smart) TV, subscribe to Amazon for £79 per annum or wait patiently again for the DVD release. I can’t help feeling this is likely to impact the overall viewing figures here in the UK. Husband to a Scottish wife.